It’s hard to believe that Easter is only a few weeks away. And whether you’re in charge of bringing the cookies or the pie, we’ve got you covered! Just think of us as your one stop Easter Bakery shop! Let’s start with a perennial favorite – Bunny Smiley Cookies! 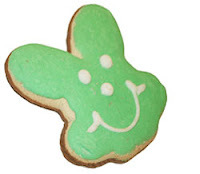 Sure to bring a smile to anyone’s face, these cookies are always a hit in an Easter basket, the office or school parties. Plus, they’re on sale for just $6.99 through the end of March. That’s sure to make some-bunny very happy! Next up are our pies. Choose from fresh made pies like Oreo Crème, Coconut Crème, or Apple – we have something for everyone! And if life is giving you lemons, then try our Lemon Meringue Pie! It’s on sale this month for just $6.99. Why bake when you can order a pie from Eat’n Park? Call ahead to your local Eat’n Park to place your pie order today. * Sugar-dusted Egg Smiley Cookies and Bunny Smiley Cookies dipped in Sarris milk chocolate are only available online at SmileyCookie.com.